In the aftermath of the Chernobyl disaster, 350,000 people were presented with the heart-rending decision: to stay in their homes and risk exposure to radiation, or to uproot their lives and move away. The overwhelming majority left. Holly Morris: Why stay in Chernobyl? Because it's home. But in today’s powerful talk, Holly Morris introduces us to a group of elderly women who returned to Chernobyl after the disaster, setting up their lives in the toxic dead zone. Choosing the comfort of familiarity over lonely, transplanted lives in Kiev, these babushkas have lived in their ancestral land, on radioactive soil, for the past 27 years. “Home and community are forces that rival radiation,” Morris concludes. 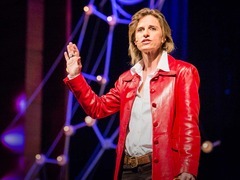 Last year, another TED speaker offered a different perspective on the Chernobyl aftermath. 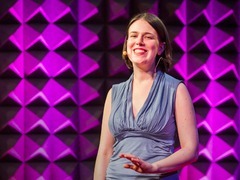 Speaking at TED@New York, Tania Luna reflected on the beauty and heartbreak of her own childhood, as her family was uprooted by nuclear meltdown and relocated to the United States. After watching today’s talk, she shares her own thoughts on her family’s decision to leave, and what their life has been like ever since. Tania Luna: How a penny made me feel like a millionaire After Chernobyl, the rain came down black. My sister’s hair fell out in clumps. I was one at the time, and spent nine months in the hospital. There were no visitors allowed, so my mother bribed a hospital worker to acquire a nurse’s uniform. She snuck in every night to sit by my side. Five years later, the unexpected silver lining came of getting asylum into the US. By the time we were offered a chance to leave, I had made a full recovery and we lived far enough from ground zero that we figured the worst was already over. We weren’t just leaving because of fear of radiation. We were leaving Ukraine because we waited in queues for hours to buy things like milk and pantyhose. Because we didn’t trust our government anymore. Because, thanks to my father’s tiny furniture store, we received death threats from people who didn’t appreciate his attempt at entrepreneurship (i.e. capitalism). And because everyone said that America was better (in every way). Plus — and this part is hard to explain — America had blue jeans. For my Baboosia, America has been better in almost every way. She’s now 87 and has an easier, safer, and more comfortable life than she ever experienced in Ukraine. At her 80th birthday party, she had over 100 guests — all friends she made here in New York. Back home, she never had more than a handful of friends. So it’s always been strange to me that nostalgia colors her everyday life. Since I was a child, I have been acutely aware of a sadness that sits right beneath the surface of all her other emotions. Maybe a lifetime of poverty and war will do that to you (at one point her family ate only raw potato peels to keep from starving), but I think it has more to do with being far from home. I can’t imagine how that must feel. Like Holly Morris, I too am more attached to my laptop than any physical location. What must it be like to feel “away from home” for over 20 years? And now that our world is changing with such ferocity, will the entire concept of “home” become a relic of the past? I feel sadness for my grandmother, knowing that she will never “get over it.” Knowing that she’ll always be far from home, even if she goes back to visit. But part of me also feels sadness for the feeling of home I’ll never have and for the bittersweet sting of nostalgia that I, and so many people of my generation, will never experience. Reblogged this on random rants from my crazy brain.